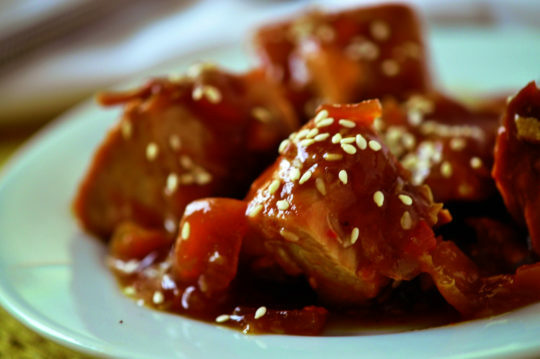 A touch of sweet with a touch of heat in this exceptionally wonderful chicken dish. Serve over rice. This recipe is from Holly Clegg’s trim&TERRIFIC® KITCHEN 101. In 3 ½-6-quart slow cooker, insert plastic liner if desired, or coat slow cooker with nonstick cooking spray. Add honey, soy sauce, ketchup, oil, onion, garlic and pepper. Add chicken and mix with sauce. Cover and cook on LOW 4-5 hours or until chicken is tender. Remove chicken to plate, leaving sauce in slow cooker. In small cup, combine cornstarch and water, mixing well. Pour into slow cooker; stirring into sauce. Cover and cook sauce on HIGH 10 minutes or until slightly thickened. Cut chicken into bite size pieces and return to pot, stirring. Sprinkle with sesame seeds and serve.